Many of the businesses featured in this column met unfortunate ends, whether it be from the death of the founder, or economic circumstances. The Indianapolis Recorder is not one of those – founded in 1895, the Indianapolis Recorder still prints today, and has many plans for the future. It is hailed as one of the top African-American publications in the nation. In 1895, George P. Stewart and Will Porter began publishing what would become the Indianapolis Recorder as a two-page church bulletin. 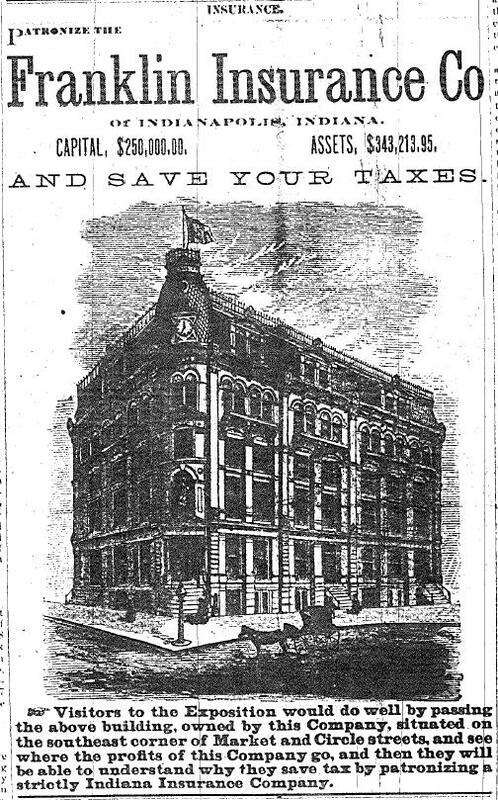 Stewart and Porter expanded their bulletin to a weekly newspaper two years later, and the earliest surviving issues begin in 1899, when Porter sold his share to Stewart for $300. George Pheldon Stewart was born in Vincennes, Indiana on March 13, 1874. His family moved to Indianapolis around the time Stewart was twenty years old, just a year before he began publishing that two-page church bulletin with Porter. Stewart was a member of a number of community based and politically motivated groups, but was most active with the Knights of Pythias, a fraternal organization founded in Washington DC in 1864, and the Indiana Republican Party. 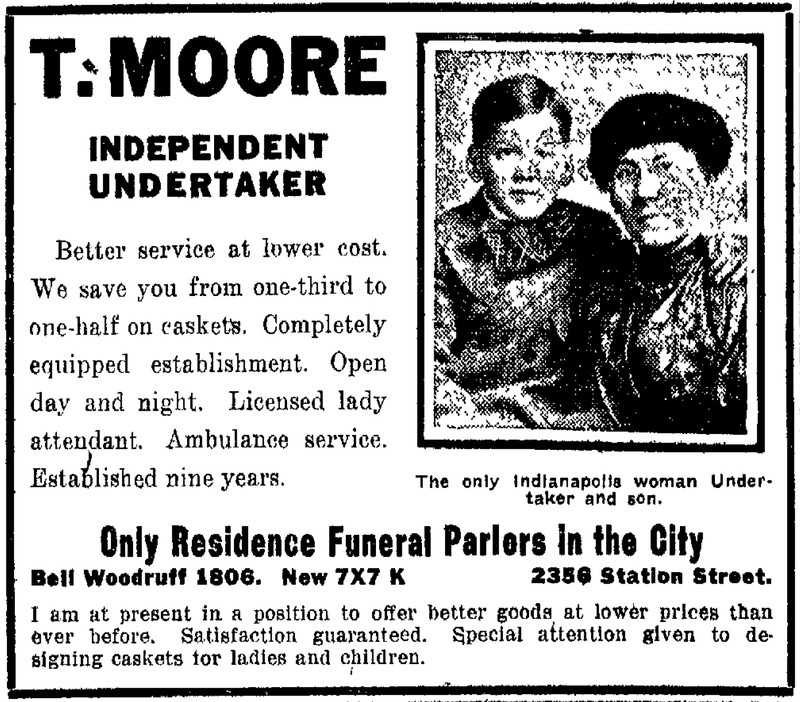 After Stewart’s death in 1924, the Indianapolis Recorder was managed by a member of the Stewart family until 1988, when it was purchased by Eunice Trotter. Businessman William Mays bought and revitalized the Indianapolis Recorder in 1990. His niece, Carolene, took control of the newspaper in 1998. 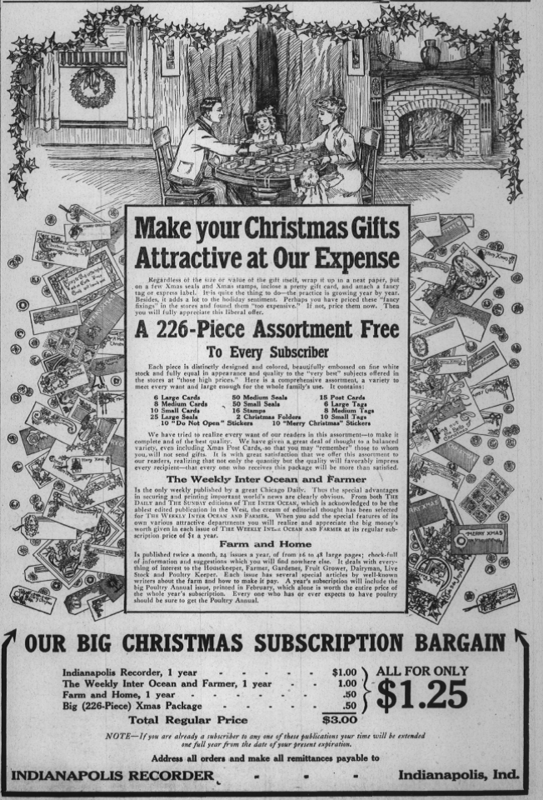 The Indianapolis Recorder pre-dates the Indianapolis Star and has outlived all other Indianapolis-based newspapers founded in the 19th and 20th centuries. That’s a lot of subscriptions! 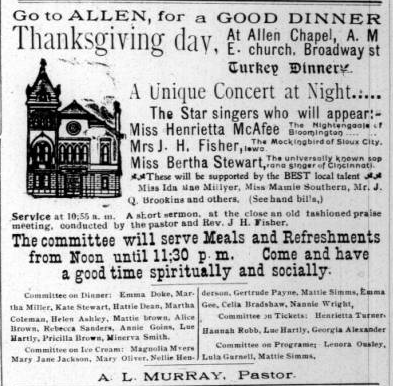 Sunday Adverts: Turkey Dinner at Allen A.M.E. Thank you for this article. I only recently read it. I’m writing to correct a tad bit of the history. I have found myself in this unfortunate role frequently since returning to Indianapolis. There has frequently been the picture painted of a failing Indianapolis Recorder when I sold my interests to Bill Mays. That was NOT the situation of The Recorder. It was vibrant and thriving and had the highest circulation it has had since I sold it. In fact, The Recorder’s circulation plummeted after the sale and is now about 5,000. It was 13,000 when I sold it. Please help me correct this revisionist history. Thank you. Please contact me if you would like to talk about this more. Best regards.